We revised down our estimate of the sustainable unemployment rate three times between 2015 and 2017, with unemployment falling faster than we had expected over that period but little evidence of rising wage pressure. This box from our March 2018 EFO compared the revisions we had made with those of the Congressional Budget Office in the US, which had faced similar issues when forecasting US unemployment. The outlook for productivity growth is one of the most important and yet uncertain areas of our economy forecast. In this box from our March 2018 EFO we looked at how actual productivity growth can be broken down into contributions from capital deepening and total factor productivity (TFP) growth and how differences in investment across countries could be related to post-crisis productivity performance. Our first post-EU referendum forecast in November 2016 assumed that leaving the EU would result in a less open economy and lower productivity, but we did not incorporate an explicit link between the two over our medium-term forecast horizon. This box from our March 2018 EFO discusses why we did not include this link and what other forecasters have assumed. The Pension Protection Fund is a significant part of the public sector, but as of March 2018 it did not appear in either outturn public finances data or in our forecasts. This box from our March 2018 EFO explained why that was the case, and why recent announcements from the Office for National Statistics meant that it represented a significant classification risk to our forecast. In 2017, the Government announced plans to reduce maximum permitted stakes on fixed-odds betting terminals (FOBTs) from £100 to between £50 and £2. This box from our March 2018 EFO explored recent trends in machine games duty (MGD) receipts and the contribution of FOBTs to them, illustrating the scale of receipts that might be affected by the planned policy change. Spending on tax credits came in consistently lower than our forecasts from 2014-15 onwards. In our March 2018 EFO we increased our assumption for the growth in incomes of tax credits families relative to headline earnings growth, significantly lowering our tax spending forecast. This box set out the analysis that underpinned this change in forecasting assumption. Local authorities’ net use of reserves (the amount they add to or drawdown from their stock of reserves) is a key judgement in our fiscal forecasts. This box from our March 2018 EFO examined two indicators of the general financial health of English local authorities over the period 2010-11 to 2016-17, assessing how these metrics might be used to inform our forecast judgements. Student loans are the largest component of our financial transactions forecast, and even small changes to information about student numbers can have a significant impact on our public sector net debt forecast. This box from our March 2018 EFO discussed our previous and current student numbers forecasts and the factors that we take into account when producing them. Survey evidence suggested that firms were building inventories ahead of the UK's exit from the EU. In this box we considered prospects for stockbuilding and the implications for GDP growth. How do governments respond to good and bad news in our forecasts? Presented with an improvement in the outlook for the public finances, the Government decided to loosen discretionary fiscal policy at this event. In this box we considered how Governments have responded to past pre-measures fiscal forecast changes. Revisions to National Accounts data are a normal part of the Blue Book process, which reconciles the different measures of GDP and incorporates information from annual data sources. This box explored how the estimated path of real GDP growth since 2010 has evolved over time, focusing in particular on revisions to GDP growth in 2012. The vote to leave the EU had caused in a a slowdown in real GDP growth in the UK, with the main driver being weak investment growth. This box compared UK growth and investment since the referendum to that in the other major advanced countries in the G7. Why have onshore CT receipts performed so well since 2013-14? In recent years, onshore corporation tax receipts have repeatedly surprised on the upside. This box described the drivers behind that strength, in particular the contribution from a rising effective tax rate despite cuts to the headline rates. Measures of reported disability prevalence are often subject to great variability and this can make drawing precise conclusions from them difficult. In this box, we considered two examples where measures varied. The first related to differences between Labour Force Survey and General Health Survey measures of working-age disability prevalence and the second to large changes in the former. We discussed differences in methodology and changes in attitudes as possible drivers. Public financial support for disabled people extends beyond the extra-costs disability benefits and includes several other welfare payments. This box gave an overview of some of the most important interactions between disability and other benefits that provide support for disabled people. Our ability to forecast accurately is heavily dependent on the quality of the data we can use. In this box we explained how statistical and expenditure data could be distorted by problems in delivery of the benefit, and the difficulties this creates in identifying emerging trends in the data. There are several possible approaches to forecasting benefit spending. In this box we outlined the key issues the modelling of disability benefits needed to address, the three approaches we used to forecast spending, and the strengths and limitations of each, concluding that a combination of approaches was better than reliance on any single one. In our November 2017 EFO, we revised down our forecast for trend productivity growth so that it reached 1.2 per cent a year at the end of the medium-term horizon. For the purposes of the long-term projections in our 2018 FSR, we assumed that productivity growth would rise beyond the medium term to reach 2.0 per cent a year from 2030-31 onwards. In this box we provided context for our long-term assumption by exploring the rises and falls in UK productivity growth over the past two-and-a-half centuries. The Government commissioned two reports published in 2017 to inform its review of the State Pension age (SPA): an independent review by John Cridland and a report by the Government Actuary’s Department (GAD). This box summarised the key findings from these two reports. Our 2018 long-term fiscal projections suggested that, if left unaddressed, the public sector finances would come under increasing pressure over the next 50 years. This box compared our long-term age related spending projections over the period from 2025 to 2065 with those presented in the European Commission's 2018 Ageing Report. In the 2018 Economic and fiscal outlook we discussed how the unemployment rate – which had fallen to its lowest level since 1975 – may not necessarily give a complete picture of the extent of labour market slack. This box therefore looked at some other measures, some of which suggested there could be more spare capacity than was captured by the unemployment rate at that time and some of which could be used to argue that there was less. In each Economic and fiscal outlook we publish a box that summarises the effects of the Government’s new policy measures on our economy forecast. These include the overall effect of the package of measures and any specific effects of individual measures that we deem to be sufficiently material to have wider indirect effects on the economy. In our October 2018 Economic and fiscal outlook, economy forecast adjustments included the effects of looser fiscal policy on GDP and inflation, the effects of capital allowances on business investment, the effects of tax policy changes on inflation and the effects of the extension of the Help to Buy scheme on the housing market. Alongside the October 2018 Economic and fiscal outlook (EFO) the Government expressed its aspiration to end low pay, noting the definition used by the OECD, which corresponds to two-thirds of median earnings. This policy was not firm enough for us to incorporate into our central forecast. Nevertheless, in this box we drew on previous analysis from our July 2015 EFO – when the National Living Wage was first introduced – to illustrate the potential effect on the economy and public finances. In our October 2018 forecast, the saving ratio – excluding pension contributions - was expected to turn negative, while unsecured debt was expected to rise steadily as a share of household income. In this box, we set out why this did not mean our growth forecast was dependent on a large and unsustainable increase in consumption, nor a significant expansion in consumer credit. Estimates of the saving ratio are subject to frequent revision, while only just over a third of unsecured debt relates to consumer credit, with a small and growing share made up by student loan debt. We also expect total interest payments on debt to remain subdued over the forecast period. In August 2018 the Government announced an ambition to increase the UK's exports to 35 per cent of GDP. In this box we explored the drivers of previous changes in the exports-to-GDP ratio and how we expect it to change in our October 2018 forecast. In the March 2018 Economic and fiscal outlook (EFO) we set out in detail how we calculated the cost of the Government’s financial settlement with the EU. This box from our October 2018 EFO updated our estimate of the financial settlement’s cost and the reasons for the changes since March. The accounting treatment applied to the burgeoning stock of student loans has been the subject of much interest over the past year, with reports from the House of Lords Economic Affairs Committee, the House of Commons Treasury Select Committee and the Office for National Statistics. In July, we published our own contribution in Working Paper No. 12: Student loans and fiscal illusions. In this box we analysed the possible impacts of different accounting treatments on our estimate of the deficit. We incorporate sales of financial assets in our forecasts when firm details are available that allow the effects to be quantified with reasonable accuracy and allocated to a specific year. In the case of the sale of student loans the government also considers whether a sale offers value for money. This box looked at the way in which the Government uses discount rates to evaluate value for money, how this does not mean the sales strengthen the public finances and whether future sales are likely to proceed. Public sector net financial liabilities (PSNFL) is a wider measure of the balance sheet than public sector net debt (PSND) and includes all financial assets and liabilities recognised in the National Accounts. In this box we examined some of these differences and presented a projection of the componenets of PSNFL. In our 2018 Welfare trends report, Chapter 3 looked at the design of universal credit, including how the 'work allowances' within it have been changed since the policy was first factored into our forecasts. This box looked at how our estimates of the net cost or saving from UC relative to the legacy benefits have evolved over time, and the important part played by Government decisions to reduce the UC work allowances. In our 2018 Welfare trends report, Chapter 3 looked at the design of universal credit, including the role to be played by UC work coaches setting conditions and applying sanctions to encourage claimants to seek and progress in work. This box outlined the role, responsibilities and renumeration of work coaches, as set out in DWP's candidate information pack for applicants for the role. In our 2018 Welfare trends report, Chapter 4 described how we model the effects of universal credit on spending. This draws heavily on two models owned and operated by DWP - the Policy simulation model (PSM) and the Integrated forecasting model (INFORM). PSM is a static micro-simulation model that uses Family Resources Survey (FRS) data to analyse policy changes. This box detailed how the FRS is used in PSM and some of the issues that raises for our UC forecast. In our 2018 Welfare trends report, Chapter 4 described how we model the effects of universal credit on spending. This draws heavily on two models owned and operated by DWP - the Policy simulation model (PSM) and the Integrated forecasting model (INFORM). INFORM is a dynamic micro-simulation model that uses DWP administrative data to forecast the caseloads for different benefits. This box described how INFORM is used in our UC forecast and some of its limitations. Revisions to National Accounts data are a normal part of the Blue Book process, which reconciles the different measures of GDP and incorporates information from annual data sources. This box explored how the estimated path of the 1990-92 and 2008-09 recessions and subsequent recoveries evolved over time, focusing in particular on revisions to GDP growth in 2011 and 2012. In each Economic and fiscal outlook we publish a box that summarises the effects of the Government’s new policy measures on our economy forecast. These include the overall effect of the package of measures and any specific effects of individual measures that we deem to be sufficiently material to have wider indirect effects on the economy. In our November 2017 Economic and fiscal outlook, economy forecast adjustments included the effects of looser fiscal policy on GDP, the effects of tax policy changes on inflation and the effects of stamp duty relief for first-time-buyers on house prices. In each Economic and fiscal outlook we incorporate the impact of the policy decisions announced in the Chancellor’s Budget or other fiscal statement (the ‘fiscal event’). This box looked at how measures announced at the previous 16 fiscal events had tended to announce near-term giveaways but with the promise of takeaways in the later years. The Autumn Budget saw this pattern repeated. In Autumn Budget 2017, the Government announced the introduction of a permanent stamp duty land tax (SDLT) relief for first-time buyers. This box considered the effects of a previous temporary relief for first-time buyers and how the new permanent relief was expected to affect tax receipts and house prices. Local authorities’ net use of reserves (the amount they add to or drawdown from their stock) is a key judgement in our local authority current spending forecasts as it directly affects borrowing. This box outlined recent trends in use of current reserves, split by English authorities with and without upper-tier responsibilities (such as education and social care), which underpinned our November 2017 forecast judgements. In recent years there has been a significant increase in the number of people setting themselves up as single-director companies (‘incorporations’), implying an increase in the share of household income received as dividends. ONS estimates of households dividend income were revised significantly as part of Blue Book 2017, and better capture this rise in incorporations. This box discussed the implications of these revisions, which implied a much higher level of household disposable income and household saving than previous estimates. Over the past six years there has been a large discretionary fiscal tightening in the UK. This box set out estimates of the effect of fiscal policy changes on GDP growth, based on estimates of the consolidation produced by the Institute for Fiscal Studies (IFS) together with estimates of fiscal multipliers, which are drawn from the available empirical literature. The box also considered how changes in discretionary fiscal policy compared with our forecast errors for GDP growth. Initial estimates of the deficit can be revised significantly over subsequent months as more reliable data become available. This box set out how our forecasts during 2016 and 2017 evolved and how the outturns for 2016-17 were revised over time. Strong overall receipts growth in 2016-17 took receipts as a share of GDP to their highest since 1986-87. 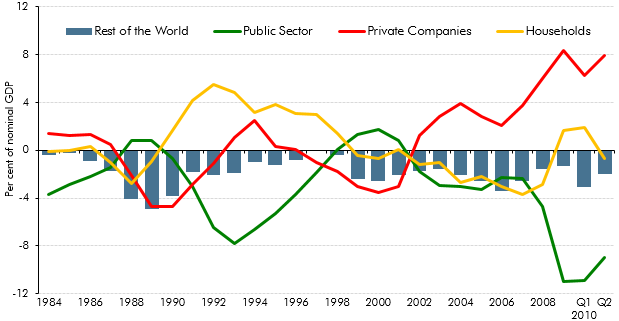 This box explored how the composition of the public sector’s income has changed over the three decades since receipts were last at the latest share of GDP. When discussing the potential impact of fiscal risks on the public sector balance sheet in our 2017 Fiscal risks report, we focused on the Government’s target measure of public sector net debt and its broader, but less-well-known counterpart, public sector net financial liabilities. In this box we considered some of the pros and cons of three even broader measures of the public sector balance sheet. Our 2017 Fiscal risks report noted the historical and international evidence that financial crises have been a major source of risk to the public finances. Since the crisis of the late 2000s, the UK Government has reformed its regulation of the financial system. In this box we outlined key elements of those reforms, which aim to ensure that should a bank fail it can be managed in a way that protects the wider economy and financial system. In each Budget or Autumn Statement, there are typically lots of policy giveaways (tax cuts or spending rises) and takeaways (tax rises or spending cuts). The net effect of these will be to raise or reduce borrowing in specific years and on average over the five years of the forecast – in other words to loosen or tighten fiscal policy. In this box from our 2017 Fiscal risks report we considered the pattern of those policy changes since 2010, noting that near-term giveaways are often financed by the promise of medium-term takeaways. All elements of GDP data are subject to revision, which creates one source of uncertainty in our forecasts. Business investment data are particularly prone to revision. In this box from our March 2017 Economic and fiscal outlook we looked at past revisions in business investment data and compared the volatility and average revision of UK data with those produced by other countries. Strong growth in consumer credit in the run-up to our March 2017 Economic and fiscal outlook had prompted concerns among some commentators about its sustainability. In this box we considered the drivers of consumer credit growth, including the role of dealership car finance, and the extent to which it may have supported household consumption growth. In each Economic and fiscal outlook we publish a box that summarises the effects of the Government’s new policy measures on our economy forecast. These include the overall effect of the package of measures and any specific effects of individual measures that we deem to be sufficiently material to have wider indirect effects on the economy. In our March 2017 Economic and Fiscal Outlook, we adjusted our economy forecast for the effects of reducing the ‘personal injury discount rate’. PAYE income tax is the Government’s single most important source of revenue, and one where our forecasts since 2010 have tended to be revised down over time. In this box from our March 2017 Economic and fiscal outlook, we explored the role that changes in the distribution of earnings might have played in explaining the shortfalls in income tax receipts. In February 2017, just ahead of the Spring Budget and our March Economic and fiscal outlook, the Ministry of Justice announced that the ‘personal injury discount rate’ would be reduced from 2.5 to minus 0.75 per cent (in inflation-adjusted real terms). This box explained the direct and indirect effects of this change on our receipts and public spending forecasts. Ahead of our March 2017 Economic and fiscal outlook, self-assessment tax receipts indicated that the Summer Budget 2015 reforms to the taxation of individual dividend income had prompted even greater income shifting than we had expected. The reforms raised the basic, higher and additional rates by 7.5 percentage points from April 2016 and introduced a tax-free allowance on the first £5,000 of taxable annual dividend income. They were pre-announced, giving taxpayers around eight months to bring forward dividend income into 2015-16 so that it was taxed at the lower rate. This box considered the amount of income brought forward and the effect of that on tax receipts. Our post-EU referendum publications noted many direct or indirect Brexit-related uncertainties across our economy and fiscal forecasts. One area that will be directly affected after Brexit is customs duties. In our March 2017 Economic and fiscal outlook, this box outlined the how customs duty was currently treated in the public finances data and the fiscally neutral approach that we had used in our forecast pending further information on post-Brexit policy settings. A key issue in our welfare spending forecast is the transition to universal credit (UC) from the existing ‘legacy’ benefits and tax credits systems. In our March 2017 Economic and fiscal outlook, our central forecast was constructed by forecasting the ‘legacy’ system as though UC did not exist, then subtracting from it an estimate of the marginal saving associated with rolling out UC. This box presented estimates for actual gross spending in 2017-18 on UC and the legacy benefits and tax credits that it is replacing. Why does net borrowing now rise in 2017-18? For the first time in any Economic and fiscal outlook, our March 2017 forecast showed post-measures borrowing rising year-on-year in one year of the forecast – 2017-18. This box explored the factors that explained why borrowing was expected to rise in that year, when our November 2016 forecast had assumed it would continue to fall. At Autumn Statement 2016 the Government asked us to forecast two new balance sheet metrics: PSND excluding the Bank of England and public sector net financial liabilities (PSNFL), a broader measure covering all the public sector’s financial assets and liabilities recorded in the National Accounts. This box presented our long-term projections for these two new balance sheet metrics with particular focus on PSNFL as PSND with and without the Bank of England tended to converge in our medium-term forecast and were expected to continue to do so over the long-term. In each Economic and fiscal outlook we publish a box that summarises the effects of the Government’s new policy measures on our economy forecast. These include the overall effect of the package of measures and any specific effects of individual measures that we deem to be sufficiently material to have wider indirect effects on the economy. In our November 2016 Economic and Fiscal Outlook, economy forecast adjustments included the effects of looser fiscal policy on GDP and the effects of tax policy changes on inflation. Before November 2016, our forecasts for mortgage debt (secured debt) were based on forecasts for mortgage demand and supply, as the determined by relationships in our house price model. In light of systematic forecast errors, this box outlined changes to our methodology for forecasting mortgage debt, which moved to an approach based on an accumulation identity. Following the June 2016 referendum result, we made a number of broad assumptions about the likely impact on trade, based on the average effects estimated in external studies. Given the importance of these assumptions, we looked at some past trends in this area, including the geographic composition and the relative importance of goods and services trade. We also set out some of the drivers of changes in exports as a share of GDP since 1999 and discussed the possible effects of trade on UK businesses and households. Our PAYE, SA, NICs and corporation tax (CT) forecasts are affected by our assumption that incorporations will continue their rising trend. This box covered historical estimates, the modelling of the receipts effects from incorporations and the implications for the forecast. The ONS announced that it would implement a new accruals methodology for corporation tax (CT) early in 2017. This box outlined in detail the changes to the ONS methodology. Our fuel duty receipts forecast combines our underlying forecast assumptions about the amount of fuel that will be purchased and the Government’s stated policies on the fuel duty rates that will be levied on those purchases. This box outlined the changes in fuel duty and policy assumptions since 2010. The UK currently makes a substantial net financial contribution to the activities of the European Union. This box outlined the historical liabilities and other commitments entered into that officials, institutions and MEPs were said to be arguing that the UK should pay a share of, in light of Brexit. The box also listed government policy commitments to fund spending in certain areas where EU funding would be withdrawn. Ahead of the Chancellor’s Autumn Statement and our November 2016 Economic and fiscal outlook, the Institute for Fiscal Studies published an assessment of the outlook for the public finances. In this box, we described the differences between our new pre-measures forecast and that assessment. Stamp duty land tax (SDLT) is one of the more volatile sources of receipts. In our 2016 Forecast evaluation report, this box identified a number of reasons why forecasting SDLT receipts is challenging, including the concentration of receipts in a small proportion of expensive properties and the effects of significant policy changes. Our 2016 Forecast evaluation report was published around four months after the EU referendum was held. Over that period forecasters had revised their real GDP growth and borrowing forecasts. This box summarised those revisions and the relationship between them. It illustrated the uncertainty that forecasters faced in trying to predict the impact of the referendum result and Brexit on the economy and public finances. The path of productivity growth is a key driver of GDP growth in our forecast and is also one of the most uncertain judgements. In March 2016, given persistent weakness in outturn data, we revised down our forecast for productivity growth. But this issue was not specific to the UK, with productivity having disappointed in many other major advanced economies. This box compared different vintages of UK and US productivity and potential output forecasts since 2010 to illustrate this point. In each Economic and fiscal outlook we publish a box that summarises the effects of the Government’s new policy measures on our economy forecast. These include the overall effect of the package of measures and any specific effects of individual measures that we deem to be sufficiently material to have wider indirect effects on the economy. In our March 2016 Economic and Fiscal Outlook, we made a number of economy forecast adjustments to GDP, business investment, wage growth, inflation and the housing market. The government consumption deflator measures the implied price of government services. International comparisons show that different methodologies for deriving the government consumption deflator affect the extent to which nominal changes are interpreted as driven by changes in prices as opposed to volumes. This box outlined how these methodologies affected government consumption compared to pre-recession averages for six leading industrial countries. Our March 2016 Economic and fiscal outlook forecast was affected by an unusual quarterly profile of GDP growth on the non-seasonally adjusted measure that the Office for National Statistics uses as the denominator in fiscal measures. This box outlined that unusual pattern, how we had factored it into our forecast and the effects it had had on the profile of the debt-to-GDP ratio. In our November 2015 forecast, we anticipated the effect on the public finances of the ONS decision to reclassify private registered providers of social housing in England. This box outlined the policy measures which affect our forecast, the effect on the public finances and changes in these forecasts since November. Since our March 2014 Economic and fiscal outlook, our debt interest spending forecast was revised down significantly as market expectations of the interest rates at which the Government can borrow and service its debt moved progressively lower and as inflation fell. This box explained some possible factors that could have caused market expectations of interest rates to rise and the effect on the fiscal position of a sudden increase in interest rates. Recent estimates of UK GDP growth represent an early draft of economic history that will be revised, often substantially, over time. OECD found that initial estimates of UK GDP growth have tended to be revised up over time. This box also highlights revisions to estimates of US and UK productivity growth between July and November 2015, and the substantial productivity shortfall relative to the US and relative to the pre-crisis trend in the UK. In each Economic and fiscal outlook we publish a box that summarises the effects of the Government’s new policy measures on our economy forecast. These include the overall effect of the package of measures and any specific effects of individual measures that we deem to be sufficiently material to have wider indirect effects on the economy. In the 2015 Autumn Statement and Spending Review, we made a number of adjustments to real and nominal GDP, the labour market, inflation, and the housing market. In July 2015, the Government announced the ‘National Living Wage’ (NLW) for workers aged 25 and above. This box from our November 2015 Economic and fiscal outlook outlined how revisions to the wider economy forecast affected our NLW forecast and also explored some of the potential labour market and employer responses to the NLW. In our November 2015 Economic and fiscal outlook, government consumption was forecast to fall by 5.2 per cent of GDP between its peak in 2009 and 2019. This box looked at historical and international comparisons to give some context for this fall, as well as considering the possible impact on the composition of nominal GDP. At Budget 2012, the Government stated its aspiration to increase the value of UK exports to £1 trillion by 2020. This box outlined the main drivers of export growth in our November 2015 Economic and fiscal outlook and the implications for our forecast relative to the Government's aspiration. Modelling changes were made to the deductions element of the VAT model and to introduce a new model for NICs. The box outlined the modelling changes and the likely effect on receipts. The July 2015 Budget included a large number of complex welfare measures that cut across multiple benefits with many interactions. At Autumn Statement 2015, we identified a number of measures where interaction effects had not been correctly estimated or classified. In this box of our November 2015 EFO, we discussed the re-estimation and reclassification of the interaction effects of a number of welfare measures. This included the reclassification of three tax credits measures and the measure extending the `lone parent obligation’ to ensure that these costings were consistent with our marginal universal credit (UC) forecast. The impact of cuts to tax credits on housing benefit entitlement were also re-estimated and reallocated to the housing benefit forecast from the tax credits forecast as the effect had previously been incorrectly allocated to tax credits. As part of our economic forecast, we produce forecasts for total employment and GDP per capita based on ONS population projections. Relative to our June 2010 forecast, employment in 2015 was 1 million higher than expected and GDP per capita over the period increased by 4.5 per cent lower. This box from our July 2015 Economic and fiscal outlook examined the reasons for these forecast errors. In the run up to the July 2015 Budget, fiscal policy had been tightened every year since 2010-11. This box, published in our July 2015 Economic and fiscal outlook, set out the fiscal multiplier framework used to estimate the overall effect of changes in fiscal policy on the economy. This box also outlined two ways in which this framework changed with regards to the tapering of multiplier effects across time and the assumed differences in multiplier effects on real and nominal GDP. In each Economic and fiscal outlook we publish a box that summarises the effects of the Government’s new policy measures on our economy forecast. These include the overall effect of the package of measures and any specific effects of individual measures that we deem to be sufficiently material to have wider indirect effects on the economy. In the July 2015 Economic and fiscal outlook, we made a number of adjustments to real and nominal GDP, the labour market, inflation, business and residential investment, and the housing market. HMRC includes provisions in its accounts to cover risks from litigation cases where the tax at risk is greater than £100 million. This box highlighted the relationship between HMRC provisions, the amounts actually utilised and how this related to the July 2015 OBR forecast for likely tax litigation costs. The Government undertook a number of interventions in the financial sector in response to the financial crisis and subsequent recession of the late 2000s. This box provided an update of the estimated net effect of them on the public finances as of July 2015. Our March 2015 Economic and fiscal outlook forecast highlighted that CGNCR ex outturn were significantly lower than what implied by our fiscal forecast. This box decomposed the revisions to CGNCR ex since our March 2015 forecast and it explained the factors that contributed to the divergence between our CGNCR ex forecast and the outturn. Why have oil prices fallen by so much? In each Economic and fiscal outlook we publish a box that summarises the effects of the Government’s new policy measures on our economy forecast. These include the overall effect of the package of measures and any specific effects of individual measures that we deem to be sufficiently material to have wider indirect effects on the economy. In our March 2015 Economic and Fiscal Outlook, we made adjustments to nominal GDP, inflation and North sea production. RPI inflation differs from CPI inflation for a number of reasons. Collectively the difference between the two measures is refered to as the 'wedge'. In light of more evidence this box, from our March 2015 Economic and fiscal outlook, re-examined historical contributions to the 'wedge' and set out our latest assumptions for the long-run difference between the two measures. The data available at the time of our March 2015 Economic and fiscal outlook showed the current account deficit had worsened to around 6 per cent of GDP in the third quarter of 2014, one of the largest quarterly deficits on record. Much of the recent deterioration was down to the income balance moving into deficit, the drivers of which were discussed in this box. The Government undertook a number of interventions in the financial sector in response to the financial crisis and subsequent recession of the late 2000s. This box provided an update of the estimated net effect of them on the public finances as of March 2015. Our March 2015 Economic and fiscal outlook forecast highlighted large changes in our debt interest forecast since previous fiscal events and the added complexity that debt interest was expressed net of the effect of gilts held by the Bank of England Asset Purchase Facility (APF) associated with past quantitative easing. This box described how we produced the debt interest forecast and illustrated some of the sensitivities to which it was subject. The UK budget deficit increased to a post-war high after the financial crisis and recession of the late 2000s. This box explored how the path and composition of deficit reduction in the UK over the subsequent 5 years compared to five other major economies. In recent years, historical path of business investment has been subject to significant revisions. This box discussed the revisions made to business investment estimates between 2007 and 2014. In Box 3.6 of our March 2014 Economic and fiscal outlook, we considered this issue from an international perspective. Between 2012 and 2014, growth in the UK picked up, outpacing all other members of the G7. This box provided wider context for this strength in UK growth, comparing GDP, employment and productivity growth across G7 countries since 2008. In the December 2014 Economic and fiscal outlook, we identified the adjustment in the euro area as a risk to our forecast. This box highlighted some of the key indicators that commentators were using to measure the progress of that rebalancing. This box decomposed the net trade contribution to GDP growth into its various drivers, to illustrate the sources of the negative contribution in the seven years before the late-2000s recession, the positive contribution in the seven years after the recession and the negative contribution in the December 2014 forecast. The Government undertook a number of interventions in the financial sector in response to the financial crisis and subsequent recession of the late 2000s. This box provided an update of the estimated net effect of them on the public finances as of December 2014. This box evaluated anti-avoidance measures implemented between 2011-12 and 2013-14. The exercise confirmed that while these costings were subject to significant uncertainty, there was no evidence of systematic bias. Public finances data are subject to regular classification and methodological changes. This box outlined the classification changes associated with the implementation of the new 2010 European System of Accounts (ESA10). Annex B of our March 2014 EFO explained these changes in more detail. North sea oil and gas revenues have historically been volatile. This box showed how movements in revenues between the peaks and troughs since the early 1970s can be explained by drivers of taxable profits - the volume and price of production (which together provide a proxy for sales), the implied profit margin on those sales and the effective tax rate paid on those profits. The Government announced substantial reforms to the residential stamp duty land tax (SDLT) system at Autumn Statement 2014. This box explored how the tax system changed and how these reforms were costed. What does our forecast imply for day-to-day public services spending? We were asked by our stakeholders whether we considered the implications for current spending on public services (RDEL) in our forecasts to be central, as we are tasked with producing a central forecast. This box outlined RDEL implied spending from 2016-17 to 2019-20 (years in which firm spending plans did not exist and RDEL levels were set by a government policy assumption). The box also examined the implied breakdown of RDEL by some of the main spending areas in 2019-20, in particular examining the implications of then-current government RDEL assumptions for public services spending that was not protected in some way. In Chapter 4 of our December 2014 EFO, we discussed the fiscal outlook for 2014-15 to 2018-19. In this box, we discussed revisions we made to the forecast in light of reforms to incapacity and disability benefits. Spending on incapacity benefits was revised up by £0.7 billion a year on average between 2014-15 and 2018-19, largely reflecting a lower-than-expected number of Work Capability Assessments carried out by the Department for Work and Pension’s private contractors. On the basis of the latest evidence, spending on disability benefits was also revised up by £0.7 billion a year on average between 2014-15 and 2018-19. This was largely due to higher than expected success rates for new claims to the personal independence payment. In Chapter 4 of our December 2014 EFO, we discussed the fiscal outlook for 2014-15 to 2018-19. In this box, we discussed the latest universal credit rollout plan following the 2014 universal credit business case. Whilst we agreed that the plan to fully rollout universal credit for jobseeker’s allowance cases by March 2016 was central, we decided that the migration plan for claimants of other legacy benefits was still highly uncertain and so implemented a six month delay to the plans for our forecast. This had the effect of reducing the volume of migrations in all years of the forecast but did not substantially alter the universal forecast given that it marginal to the legacy benefits. Revisions to National Accounts data are a normal part of the Blue Book process, which reconciles the different measures of GDP and incorporates information from annual data sources. 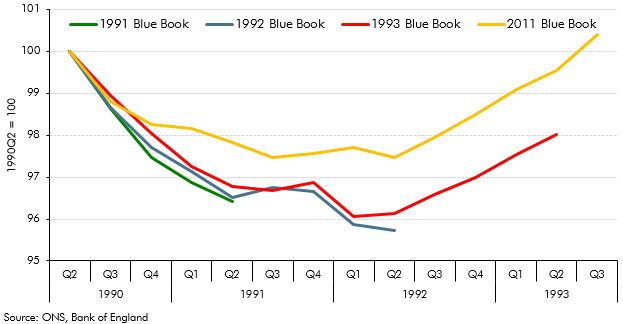 The 2014 Blue Book contained particularly large changes because it was the first time that the National Accounts were published on an ESA10 accounting basis. This box set out some of the key changes in Blue Book 2014 and their impact on some of the key economy variables. This box explored the implications of the new 2010 European System of Accounts (ESA10) on our public finances forecast, ahead of its incorporation in our December 2014 EFO. Annex B of our March 2014 EFO explained these changes in more detail. An additional rate of income tax of 50p for incomes over £150,000 was introduced in April 2010. Budget 2012 announced that this rate would be reduced to 45p from April 2013. This box explored how the incomes of those affected by this change evolved over this period - in particular the significance of forestalling and income shifting. In our 2014 Welfare trends report, Chapter 4 reviewed the overall trends in welfare spending. In this box, we considered how responsive welfare spending is to the economic cycle by estimating the elasticity of benefits and tax credits spending as a share of GDP with respect to changes in the output gap (the difference between actual GDP and an estimate of its potential or underlying level). We found that the most counter-cyclical benefits have caseloads closely associated with the economic cycle whereas mildly counter-cyclical benefits are likely to only exhibit cyclicality due to spending varying less than GDP, thereby producing a denominator effect. In our 2014 Welfare trends report, Chapter 4 reviewed the overall trends in welfare spending. In this box we discussed the latest Universal Credit (UC) forecast at the time of writing. This forecast assumed UC would roll-out slowly during 2014-15 and 2015-16 before accelerating in 2016-17 and 2017-18, by which time 5.8 million people were expected to be receiving the benefit. We highlighted that the roll out of UC had already been subject to previous delays and that the decision to produce a top-down UC forecast helped mitigate the uncertainties caused by delivery challenges. We then decomposed the marginal UC forecast into its constituent gross savings and gross costs forecasts. In our 2014 Welfare trends report, Chapter 8 considered spending on unemployed people. This box compared outturn data on unemployment and claimants of unemployment benefits to the levels implied by our March 2014 forecast. As the economy performed better than anticipated in our March 2014 forecast, the ratio of claimants of unemployed benefits to the Labour Force Survey (LFS) measure of unemployment deviated from our projections. This was largely due to a drop in the rate of inflows into unemployment benefits and a rise in the rate of outflows from unemployment benefits, though an increase in the number of people looking for jobs but not claiming unemployment benefits may have increased LFS unemployment and so been a contributing factor. The European System of National and Regional Accounts (ESA 10) changed the arrangements for funded defined benefit pension schemes. The new approach required that the net liabilities of these schemes for the future costs incurred from past activities were calculated using commercial accounting concepts. This box provided a summary of the effects that the new treatment would have, as well as its relevance to the Whole of Government Accounts (WGA). At Budget 2014, the Government announced a number of tax measures that increase the flexibility with which individuals can access their defined contribution (DC) pension assets. This box considered the effect of two possible sensitivities. First, the possibility that there would be more money flowing into the housing market, and second, that people could spend their pension pots relatively early in retirement, leading to greater reliance on income-related benefits. We updated our July 2013 analysis of fiscal drag on income tax and NICs to reflect new data, our latest assumptions and the effect of measures announced over the past year. This box outlined how fiscal drag effects income tax and NICs receipts and the long-term assumptions used. Earlier in the year, the Chancellor expressed an ambition “to have more people working than any of the other countries in the G7 group". This box compared countries employment rates and demonstrated the scope for labour market outcomes to differ substantially. Each autumn, we publish our Forecast evaluation report (FER), a detailed examination of the performance of past economic and fiscal forecasts relative to the latest outturn data. This box discussed the OECD's and Bank of England's forecast errors, their explanations for these errors, and the lessons forecasters have learnt from the errors. In the February 2014 Inflation Report the Bank of England published more information about its assessment of spare capacity. This box compared that assessment with our own output gap estimate at the time, highlighting some conceptual differences between the two. This box showed how growth in some of the key economy variables between 2010 and 2013 was lower when measured on a per capita basis. We also discussed our forecast for productivity growth at that time, given its importance in determining GDP per capita growth in the medium term. In each Economic and fiscal outlook we publish a box that summarises the effects of the Government’s new policy measures on our economy forecast. These include the overall effect of the package of measures and any specific effects of individual measures that we deem to be sufficiently material to have wider indirect effects on the economy. In our March 2014 Economic and Fiscal Outlook, we made adjustments to inflation and business investment. In 2013, households’ balances in ‘time deposit’ accounts (savings with fixed maturity) fell by £36 billion. This box outlined possible reasons for this by exploring the wider household savings behaviour. The cumulative change in annual deposit flows showed rapid increases in 'sight deposits'. This was possibly explained by narrowing spreads between 'time' and 'sight' deposit interest rates or normalisation of household investment behaviour. Changes in annual mortgage flows also suggested that revival of housing market activity could have been responsible for switching between deposit types. The ability of households to shift very large deposit balances over relatively short timeframes was one reason why the impact of savings and pensions measures discussed in Box 3.3 of the same EFO was subject to considerable uncertainty. We expected debt servicing costs as a share of disposable income, or ‘income leverage’, to rise as our forecasts for house price inflation outstripped income growth and Bank Rate gradually increased. This box discussed the extent to which mortgage servicing costs were likely to increase over the forecast period and the implications of this for household behaviour, using information from the Bank of England/NMG survey. In the late-2000s recession, total investment in the UK fell by more than in other similarly-developed economies, but in the March 2014 forecast we expected it to pick up strongly. This box considered possible reasons for the previous weakness and compared the investment-to-GDP ratio in our forecast against OECD averages. The Bank of England’s purchases of gilts under its quantitative easing (QE) programme are undertaken by its subsidiary, the Asset Purchase Facility (APF). Since late 2012-13, the Exchequer received excess cash held in the APF on an ongoing basis. This box summarised the approach used to estimate the fiscal impact of projected APF flows and the changes in these projections since our December 2013 Economic and fiscal outlook forecast. It also highlighted the large uncertainty about the timing and pace of quantitative easing (QE) unwinding. Receipts from capital gains tax (CGT), inheritance tax (IHT) and stamp duty land tax (SDLT) were expected to rise sharply over our March 2014 forecast. This box set out the drivers behind that rise, in particular the impact of rising effective tax rates. The Government undertook a number of interventions in the financial sector in response to the financial crisis and subsequent recession of the late 2000s. This box provided an update of the estimated net effect of them on the public finances as of March 2014. On 7 August 2013, the Bank of England announced that it would not consider raising Bank Rate, then at 0.5 per cent, until the unemployment rate had fallen to 7.0 per cent. However, the Bank also detailed certain conditions, which if breached, would make it consider tightening monetary policy sooner. This box, from our December 2013 Economic and fiscal outlook, examined where our forecast stood in relation to these conditions. In each Economic and fiscal outlook we publish a box that summarises the effects of the Government’s new policy measures on our economy forecast. These include the overall effect of the package of measures and any specific effects of individual measures that we deem to be sufficiently material to have wider indirect effects on the economy. In our December 2013 Economic and Fiscal Outlook, we adjusted our inflation forecast to reflect changes in fuel duty. Why has inflation been higher in the UK than the euro area? From late-2008 to 2013, the rate of CPI inflation in the UK had been consistently higher than the euro area equivalent measure. This box, published in our December 2013 Economic and fiscal outlook, outlined a number of factors which had contributed to the divergence including exchange rate movements, changes in VAT and utility prices. Spending on cars in the UK has grown strongly, accounting for nearly a third of household consumption growth since the third quarter of 2011. This growth was facilitated by car finance, which contributed to strong growth in unsecured credit. This box showed trends in domestic share of car production and contribution of domestic and imported cars to household consumption growth over time. Together, they showed that while domestic car consumption was a good indicator of consumer confidence, and car trade in isolation helped reduce the UK's trade deficit, the overall effect on the economy was less positive. In the years following the late-2000s recession, productivity growth remained subdued, which would be expected to lead to lower wages. This box showed that while the real product wage grew more strongly than productivity growth since 2008, real consumption wage growth was weaker. In 2012-13, excess cash held in the Bank of England’s Asset Purchase Facility (APF) has been transferred to the Exchequer on an ongoing basis requiring us to forecast future flows. This box outlined the forecasted APF flows and the changes in these estimates since March. Public finances data are subject to regular classification and methodological changes. This box outlined potential classification changes ahead of the PSF review. Annex B of our March 2014 EFO explained these changes in more detail. In this forecast, we switched to using spending data from a new source, which was the Treasury’s new public spending database known as OSCAR (short for their ‘Online System for Central Accounting and Reporting’). This led to some switches between DEL and AME, which we treated as classification changes, because they affected our presentation of DEL and AME for all years, including outturn and forecasts. This box explained those changes. In Chapter 4 of our December 2013 EFO, we discussed the fiscal outlook for 2013-14 to 2017-18. In this box, we discussed the delays to the Government’s universal credit rollout plan. Compared to the March 2013 rollout plan, large increases in the universal credit caseload were assumed to start later than previously planned in 2016 and 2017. Fewer people were also expected to be on universal credit at the end of the forecast horizon, with 700,000 fewer claimants assumed to have migrated by the end of 2017-18 compared to the March 2013 rollout plan. We explained that the changes to the rollout schedule was a key source of change in the profile of our forecast relative to March 2013, with lower spending up to 2015-16. The Government undertook a number of interventions in the financial sector in response to the financial crisis and subsequent recession of the late 2000s. This box provided an update of the estimated net effect of them on the public finances as of December 2013. Revisions to National Accounts data are a normal part of the Blue Book process, which reconciles the different measures of GDP and incorporates information from annual data sources. This box explored how the estimated path of the 1990s recession and recovery evolved from estimates made in the 1992 Blue Book to estimates made in the 2013 Blue Book. How has the story changed since last year? In our 2012 Forecast Evaluation Report, we noted that nominal GDP had held up closer to our June 2010 forecast than real GDP, helping to explain why our fiscal forecasts out to 2011-12 had remained broadly on track. This box in our 2013 Forecast Evaluation Report discussed how this assessment changed in light of revisions to GDP data. While nominal GDP now appeared to be weaker than forecast, the relatively tax-rich components - such as nominal consumption and wages and salaries - held up relatively well. To estimate the impact of a measure or package on the economy, we use a set of fiscal multipliers. This box outlines some recent research on the size of multipliers, how the multiplier varies during the economic cycle and how multipliers 'taper' over time. In 2013 the National Accounts measure of PSNB and PSND widened to include Bradford and Bingley and Northern Rock (Asset Management), and also included the APF transfers from the BEAPFF to central government. This box explained how the QE and APF transactions are treated in WGA and in the National Accounts, and the differences between them. We updated our 2012 analysis of fiscal drag on income tax and NICs to reflect new data, our latest assumptions and the effect of measures announced over the past year. This box outlined how fiscal drag effects income tax and NICs receipts and the long-term assumptions used. In assessing indicators of sustainability we examined the role of the gap between the real interest rate on government debt and the long-run growth rate of the economy. This box outlined the reasons behind Post-World War II debt reduction. Is it plausible to assume a negative output gap after five years? In early OBR forecasts we estimated a significant negative output gap following the late-2000s recession, which we did not expect to have closed by the end of the forecast horizon. Our March 2013 forecast implied that potential output would be 14.6 per cent below an extrapolation of its pre-crisis trend after five years, with actual output a further 2.3 per cent below that. This box examined the implications of that forecast, as well as the fiscal implications of some possible alternative assumptions. The household saving ratio continued to rise in 2012. This box explored the possible reasons for this, considering evidence from the latest available NMG household survey. The box also discussed the implications for household balance sheets, noting that in aggregate households appeared to have used higher saving to finance accumulation of more financial assets, rather than paying down debt. Exports fell during 2012, partly reflecting lower growth in UK export markets and a rise in sterling, although part of that fall was unexplained. This box looked at some past trends in the composition of exports to offer some explanation for that weakness, highlighting in particular the fall in financial services exports, and compared this against trends seen in the US. Our general government employment (GGE) forecast is based on projections of the growth of the total government paybill and paybill per head, which is in turn based on the Government's latest spending plans. In this box we compared our GGE forecast against the outturn data since the start of the 2010 Spending Review period. This allowed some assessment of how public sector employers were progressing with their intended workforce reduction and how much adjustment would still be required. In Chapter 4 of our March 2013 EFO, we discussed the fiscal outlook for 2013-14 to 2017-18. In this box, we introduced a new marginal cost presentation of the universal credit forecast and also outlined contributing factors to changes in the forecast. These factors included policies announced at the 2012 Autumn Statement and changes to a number of the universal credit policy parameters as well as refinements to the methodology and assumptions used to forecast universal credit. The analysis in this box has since been superseded by developments in the universal credit forecast. The Government undertook a number of interventions in the financial sector in response to the financial crisis and subsequent recession of the late 2000s. This box provided an update of the estimated net effect of them on the public finances as of March 2013. The Whole of Government Accounts (WGA) contains information on future fiscal liabilities that are relevant for our forecast. This box explained how we ensured that those future liabilities reported in the WGA were fully reflected in our forecasts, where those liabilities were expected to affect the public finances. Revisions to National Accounts data are a normal part of the Blue Book process, which reconciles the different measures of GDP and incorporates information from annual data sources. This box explored the different picture of the late 2000s recession and recovery in light of the 2012 Blue Book. In October 2011, we published our first Forecast evaluation report (FER). This box summarised the key findings, including a discussion of weaker than expected GDP growth and why, despite this, public sector borrowing has fallen broadly as we expected it would. Our latest estimates of the output gap - which extended up to the third quarter of 2012 - implied a narrowing of the output gap since our previous forecast, despite actual output having remained broadly flat. Given the strength in the labour market over the period suggested a sharp fall in trend total factor productivity (TFP). This box set out the methodology behind that assessment, based on a production function approach that allowed us to separate out productivity growth into contributions from capital deepening and TFP. Productivity growth since the late-2000s recession has been relatively weak. This box set out some proposed explanations for that weakness, including measurement issues, lower investment, compositional effects, labour market factors and impaired financial markets. Most commentators believed that some combination of these factors was likely to be responsible. The relative importance of these factors also has implications for the extent to which the shortfall was believed to be demand or supply-related. The Funding for Lending Scheme (FLS) was launched by the Bank of England and the Government in July 2012 to encourage banks and building societies to expand their lending by providing funds at lower rates than prevailing market rates. This box discussed the uncertainties associated with the transmission mechanism of this scheme and the possible impact on real GDP. The Financial Policy Committee (FPC) was set up after the financial crisis to oversee the stability of the financial system. This box discussed the specific macro-prudential tools the FPC can apply and their potential implications for the economy and our forecasts. In the two years before our December 2012 forecast, real government consumption held up more than we had expected, with reductions in nominal government consumption affecting prices to a greater extent than we forecast. This box set out how these outturns would have been affected by the way the Office for National Statistics measures real government consumption, a large part of which is based on 'direct' measures of government activity. In 2012 the ONS carried out a range of methodological development work relating to consumer prices indices. This box summarised some of the key elements, including work addressing the 'formula effect' which had made an increasing contribution to the CPI-RPI 'wedge' in 2010 and 2011. This box also discussed ONS analysis and recommendations from Consumer Prices Advisory Committee on the appropriate measurement of owner occupiers’ housing (OOH) costs and their inclusion in a new index of consumer prices. During the financial crisis, both Bradford & Bingley (B&B) and Northern Rock (Asset Management) (NRAM) were transferred to public ownership. The ONS has announced that it will reclassify both bodies into the central government sector. This box outlined the impact of the reclassification on our fiscal forecast. In this forecast there were two policy switches that shifted spending between RDEL and AME, which applied from 2013-14 onwards. These policies were for the 50 per cent retention of business rates for local authorities in England, and for localised council tax reduction schemes. This box outlined these changes and examined the subsequent impact these would have on our forecasts. In Chapter 4 of our December 2012 EFO, we discussed the fiscal outlook for 2012-13 to 2016-17. In this box, we discussed changes to the provisional universal credit forecast that was included in our March 2012 EFO. Changes to the forecast were due to a number of factors, including policies announced at Budget 2012 and finalisation of policy parameters in universal credit as well as .refinements to the methodology and assumptions used to forecast universal credit. We also discussed the main uncertainties in the forecast, which largely related to the unpredictability given the scale of the policy. The analysis in this box has since been superseded by developments in the universal credit forecast, though many of the key uncertainties remain. The Government undertook a number of interventions in the financial sector in response to the financial crisis and subsequent recession of the late 2000s. This box provided an update of the estimated net effect of them on the public finances as of December 2012. Each year, the ONS publishes the National Accounts ‘Blue Book’. The revisions it contains are often a source of revisions to our subsequent forecasts. In this box, we illustrated the scope for history to be rewritten by exploring how the reported pattern of the recession and recovery of the early 1990s had evolved between the Blue Books published shortly after the recession and the most recent Blue Books available at the time. The UK, the US and Germany all saw broadly similar falls in GDP over 2009, but their labour markets responded differently. This box discussed these differences and compared the behaviour of employment, hours and productivity over this period. To estimate the impact of a measure or package on the economy, we use a set of fiscal multipliers. This box outlined some recent research on the size of multipliers and how the multiplier varies during the economic cycle. In April 2012, the Office for National Statistics (ONS) published the first set of new statistics on the total gross liabilities of UK pension providers, including the UK government. This box explored how the ONS’ pension liability estimates were calculated for public service pensions and state pensions, and compared the public service estimate to the Whole of Government Accounts (WGA) methodology. We updated our 2011 analysis of fiscal drag on income tax and NICs to reflect new data, our latest assumptions and the effect of measures announced over the past year. This box outlined how fiscal drag effects income tax and NICs receipts and the long-term assumptions used. The European Commission (EC) produces its own analysis of ageing pressures for member states every three years. This box contrasted the forecast made by the EC and the OBR for UK age related spending such as pensions, health care and long-term care. The National Institute of Economic and Social Research (NIESR) produce generational accounts estimates for the UK. The OBR produces its own long-term projections by using profiles that break down spending by year of age. This box compared the differences in public finance forecasts between the OBR and the NIESR with the latter implying a lower level of net debt by 2061‑62. Some researchers argue that the fiscal position is unsustainable if future generations are left to make a larger net contribution to the government’s finances than today’s generation. Generational accounts such as those produced by the National Institute of Economic and Social Research (NIESR) consider intergenerational equity. This box analysed this as a measure of assessing fiscal sustainability. Both forecasts and National Accounts data are subject to revision. This box discussed how outside forecasts for growth in 2010 evolved through that year and compared these forecasts with ONS outturns, from the ONS' first estimate made in January 2011 through to their latest available estimate in February 2012. In each Economic and fiscal outlook we publish a box that summarises the effects of the Government’s new policy measures on our economy forecast. These include the overall effect of the package of measures and any specific effects of individual measures that we deem to be sufficiently material to have wider indirect effects on the economy. In our March 2012 Economic and Fiscal Outlook, we made adjustments to our forecasts of real GDP, business investment and inflation. Central banks around the world launched two significant new market operations at the end of 2011. This included a program to provide liquidity support to the global financial system, as well as longer-term refinancing operations by the ECB. This box analysed the impact of these operations on the UK financial sector by looking at net capital issuance and five-year credit default swap (CDS) premia of UK banks. In light of these developments, we made adjustments to our forecast of CDS premia in our March 2012 forecast. Will household deleveraging act as a drag on growth? The path of the household debt-to income ratio since the crisis had led outside commentators to conclude that household deleveraging had further to run in the UK than the in the US. This box discussed some of the limitations of debt-to-income as a measure of leverage. An alternative measure is the debt to equity ratio - which takes into account both household assets and liabilities - which indicated that household leverage had fallen more slowly in the US than in the UK since the crisis. Residential property transactions fell sharply in 2008 as the availability of mortgage finance fell and stricter credit standards were introduced. This box explored recent trends in transactions and discussed our medium-term forecast, which is determined by our projection of average rate of turnover in the housing market. In our March 2012 forecast we expected the level of transactions to remain around 20 per cent below the pre-crisis peak by the end of the forecast period. The Government announced that it intends to take on Royal Mail’s historic pension deficit with effect from April 2012. This box explored how the transfer of the relevant assets and liabilities will impact the public sector finances. An additional rate of income tax of 50 per cent for incomes over £150,000 was introduced in April 2010. Budget 2012 announced that this rate would be reduced to 45 per cent from April 2013. This box set out how the Budget 2012 measure was costed, in particular the assumptions we made around behavioural responses and income shifting. Box 3.2 of our 2014 Forecast evaluation report reviewed this costing in detail. The Government undertook a number of interventions in the financial sector in response to the financial crisis and subsequent recession of the late 2000s. This box provided an update of the estimated net effect of them on the public finances as of March 2012. This box set out the methodology behind our PSNB fan charts. Briefing paper no.4: 'How we present uncertainty' sets out this methodology in more detail. Revisions to National Accounts data are a normal part of the Blue Book process, which reconciles the different measures of GDP and incorporates information from annual data sources. This box explored how the estimated path of the 1990s recession and recovery evolved from estimates made in the 1992 Blue Book to estimates made in the 2011 Blue Book. UK GDP had grown less quickly in 2010-11 than the OBR forecast in June 2010. This box decomposed the forecast error by expenditure component and discussed possible explanations, including the external inflation shock. Why might potential output growth have slowed? Potential output growth had been relatively weak in the period following the late-2000s recession. This box discussed some possible reasons, noting that indicators available at the time did not indicate a structural deterioration in the labour market. In each Economic and fiscal outlook we publish a box that summarises the effects of the Government’s new policy measures on our economy forecast. These include the overall effect of the package of measures and any specific effects of individual measures that we deem to be sufficiently material to have wider indirect effects on the economy. In our November 2011 Economic and Fiscal Outlook, we made adjustments to our forecasts of inflation and property transactions. In the years following the financial crisis the euro area faced a sovereign debt crisis characterised by high government debt, poor confidence in sovereign solvency and rising risk premiums on government securities. This box considered the main channels through which an intensification of the crisis could affect the UK economy, including weaker trade, tighter credit conditions, higher domestic government borrowing costs and possible financial system impairment. Our November 2011 forecast implied that households would take on around £480 billion of additional debt over the forecast period. This box discussed the implications of this for the household balance sheet, noting that a large part of the increase in household debt reflects borrowing for the purchase of assets. The box also discussed the downward revision in our household debt forecast since our previous EFO, which was largely accounted for by a combination of higher saving and a weaker housing market outlook. The corporate sector had run a significant surplus of profits over investment since 2003, and this surplus rose sharply following the crisis. This box explored some of the possible reasons for this, including the possibility that businesses may have used this to build up a buffer against future shocks. The box also discussed the uncertainties around the existing data, which may have overstated corporates' holdings of cash reserves. This box set out the impact of changes in interest rates on our public finances forecast, including debt interest spending and income tax receipts. Updated versions of our ready reckoners can be found on our website. The Government announced in June 2011 that it intended to take on Royal Mail’s historic pension deficit with effect from April 2012. This box explored the provisional estimates of the impact this transfer had on the public finances. The Government undertook a number of interventions in the financial sector in response to the financial crisis and subsequent recession of the late 2000s. This box provided an update of the estimated net effect of them on the public finances as of November 2011.
International organisations provide comparisons of deficit and debt levels. This box facilitated international comparisons by providing projections of Treaty debt and deficit on a calendar year basis. Revisions to National Accounts data are a normal part of the Blue Book process, which reconciles the different measures of GDP and incorporates information from annual data sources. This box set out the key differences between the vintage of data used for the purposes of the October 2011 Forecast Evaluation Report and the data consistent with the 2011 Blue Book. Discount rates are used to convert future cash flows into an equivalent one-off upfront sum or present value, allowing them to be presented alongside stock measures on a single balance sheet. But there is no single ‘correct’ discount rate and the use of discount rates presents some challenges in analysis of balance sheet movements over time. This box from our first Fiscal sustainability report in 2011 outlined the different discount rates used in the Treasury’s Whole of Government Accounts. Depending on ONS classification assets relating to PFI contracts can be on the public sector or the private sector balance sheet. This box outlined the accounting of PFI contracts in the National Accounts and WGA. We only include the impact of asset sales in our projections once sufficiently firm details are available for the effects to be quantified with reasonable accuracy. This box considered the risks that currently unquantifiable future asset sales may present to our projections. The Government carried out a number of reforms to the student finance support system, shifting funding from direct grants to loans to students. This box looked at the impact of student loans on public sector net debt. What if all PFI deals were brought on balance sheets? The majority of Private Finance Initiative (PFI) assets are held off the public sector balance sheet in the National Accounts. The running costs relating to existing PFI contracts are included within agreed departmental spending envelopes. This box explored the impact on our net debt projections if all capital liabilities relating to PFI contracts were included. Economic theory suggests that tax and spending can impact output directly, such as expenditure on infrastructure, or indirectly, such as influencing the decisions of households and firms. This box explored the empirical evidence on whether tax and spending has a level (temporary) effect on output growth, or a growth (permanent) effect. The sectoral landscape of the economy had changed markedly with the financial sector becoming increasing important. This box examined implications for tax revenue arising from the financial sector. Solvency is not the only criterion that can be taken into account when assessing fiscal sustainability. This box outlined how generational accounts can be used to assess if future generations will be relatively worse off than current generations and the level of intergenerational fairness. In each Economic and fiscal outlook we publish a box that summarises the effects of the Government’s new policy measures on our economy forecast. These include the overall effect of the package of measures and any specific effects of individual measures that we deem to be sufficiently material to have wider indirect effects on the economy. In our March 2011 Economic and Fiscal Outlook, we made adjustments to our forecast of inflation. At the time of publication, oil prices had risen by £15 since the previous forecast. This box, from our March 2011 Economic and fiscal outlook, considered the potential economic implications, including the short-run effects on inflation and household consumption as well as possible longer-run effects on potential supply and the equilibrium capital stock. The household saving ratio captures both the disposable income that households do not spend on consumption, and changes in the equity households have in pension funds. This box described how the household saving ratio is calculated, and considered the relative contribution of pension and non-pension saving to the saving ratio over the preceding decade. The box also discussed possible factors behind recent movements in pension saving. In the years prior to our March 2011 forecast there had been a number of changes to the rate of VAT, which affected CPI inflation. The Consumer Price Index excluding indirect taxes (CPIY) provides a measure of inflationary pressures excluding the effects that policy changes have on the CPI measure. This box considered how changes in VAT had contributed to the difference between CPIY and CPI at the time and what this meant for underlying inflationary pressures. One of the key differences between the CPI and RPI inflation measures arises from the formulae used to construct the indices. In the year leading up to our March 2011 forecast, the contribution of this 'formula effect' to the divergence between CPI and RPI inflation had increased. This box explained the possible implications for our long-run assumption about the CPI-RPI wedge and our inflation forecast. Our general government employment (GGE) forecast is based on projections of the growth of the total government paybill and paybill per head, which is in turn based on the Government's latest spending plans. Ahead of our March 2011 forecast, ONS estimates of general government employment were revised up, largely reflecting the reclassification of employees in further education colleges. In this box we set out the extent to which changes to our general government employment forecast were a result of our revised projections for paybill growth as opposed to data revisions. In our central forecast, interest rates are assumed to evolve in line with financial market expectations. For alternative economic scenarios which involve different paths for the output gap and inflation, it is useful to specify rules for the way monetary policy is set and for how output and employment will respond. In this box, we set out the rules that governed those relationships in the scenarios we analysed in the March 2011 Economic and fiscal outlook: a persistent inflation scenario and a weak euro scenario. The world price of oil increased sharply in 2010, reflecting rising world demand and unrest in the Middle East and North Africa. This box explored the impact this had on our public finances forecast at the time, from higher North Sea oil and gas revenues to the second round effects stemming from higher inflation. The Government undertook a number of interventions in the financial sector in response to the financial crisis and subsequent recession of the late 2000s. 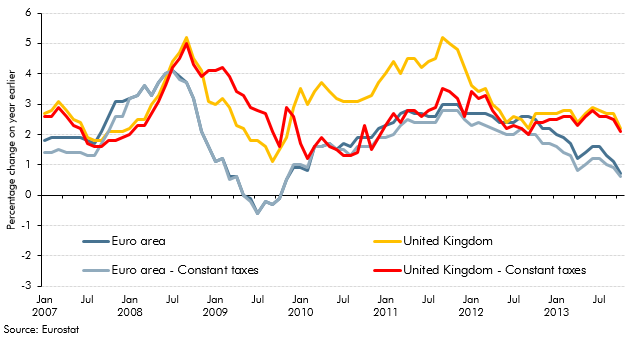 This box provided an update of the estimated net effect of them on the public finances as of March 2011. The OBR provides independent scrutiny of policy costings and determines any resultant impact on the economic forecast. An estimate of the impact of a policy measure is included in the public finances forecast only when a firm policy has been announced and there is sufficient detail to quantify the effect of the policy. This box summarised the policies that were included in our November 2010 forecast. Following the June 2010 Budget, the Government set out further details of the planned reductions in government expenditure in its 2010 Spending Review, including additional measures to reduce welfare spending. This box discussed the possible ways in which these measures could affect the economy's trend growth rate. A rebalancing away from private consumption towards investment and net trade was a theme of our November 2010 forecast. This box set out the key features of domestic sector balances over the preceding two decades. A commonly used metric of credit impairment is the price of interbank lending relative to the interest rate on short term government debt, although this does not indicate anything about the quantity of interbank lending, which fell significantly following the financial crisis. This box discussed qualitative survey evidence to assess changes to cost and availability of credit to household and firms. The Bank of England credit conditions survey suggested a modest loosening of credit conditions for both households and medium-sized firms over 2010, but the availability of credit remained constrained compared to their pre-crisis levels. In 2010 Ireland’s sovereign debt markets had effectively closed and interest rates rose to record levels as it sought international financial assistance from the IMF and EU. This box considered the potential implications of this for our forecast, including reductions in trade, risks relating to the UK banking sector's exposure to Ireland, and higher UK interest rates resulting from widespread uncertainty in bond markets. Data available at the time of our November 2010 Economic and fiscal outlook suggested that general government employment fell by 550,000 between 1992 and 1998. But some of this fall reflected the reclassification of further education colleges and sixth-form school employees from the public to the private sector in 1993. This box outlined a simple methodology which suggested that general government employment would have fallen by just over 400,000 over that period in the absence of this reclassification. Our general government employment (GGE) forecast is based on projections of the growth of the total government paybill and paybill per head, which is in turn based on the Government's latest spending plans. Ahead of our November 2010 forecast, those plans were updated as part of the 2010 Spending Review. We also made a number of refinements to our forecasting approach. In this box we described revisions to our general government employment forecast and explain the extent to which these changes were the result of methodological changes as opposed to revised spending plans. Our forecasts for tax receipts do not generally include any explicit assumptions about changes in the level of tax compliance. This box highlighted why our VAT forecast is the one exception. The Government undertook a number of interventions in the financial sector in response to the financial crisis and subsequent recession of the late 2000s. This box provided an update of the estimated net effect of them on the public finances as of November 2010. The Government set out proposals in England for a basic threshold of tuition fees of £6,000 per annum as well as an absolute limit of £9,000 in exceptional circumstances for undergraduate courses with effect from the 2012-13 academic year. This box outlined the effect of this student loan policy on the public finances. There are several technical indicators of fiscal sustainability that stem from a forward-looking approach. This box considered a number of these indicators.